Abbot Steve had chemotherapy yesterday and was in the hospital from 9 until 2. He's at home resting now. Steve continues to lose weight, and recently he has not been able to absorb fluids into his system, so now he needs to go in to receive regular fluid infusions in addition to the chemo. He tends to bring energy to what is happening, and visitors buoy him up. Afterwards, though, he is really tired and because he's unable to sleep deeply any longer, he catnaps. He has started the process of Dharma transmission for Christine Palmer, and he is grateful that it has begun. Abbot Steve has enjoyed hearing your cards and messages read to him by Lane and Mary. Mary continues to field any requests. Posted in Uncategorized on November 1, 2013 by Jay Pennington. Abbot Steve looks great with a beard and seems to be as upright as ever. I am so happy to hear, amidst all the sad news of pain, sleeplessness, and nausea, that he has begun Dharma Transmission with his wonderful student, Christine Palmer. All blesssings to them in this deep ceremony. I remember a time, when you, dear Abbot Steve, and I were newcomers to Green Gulch. 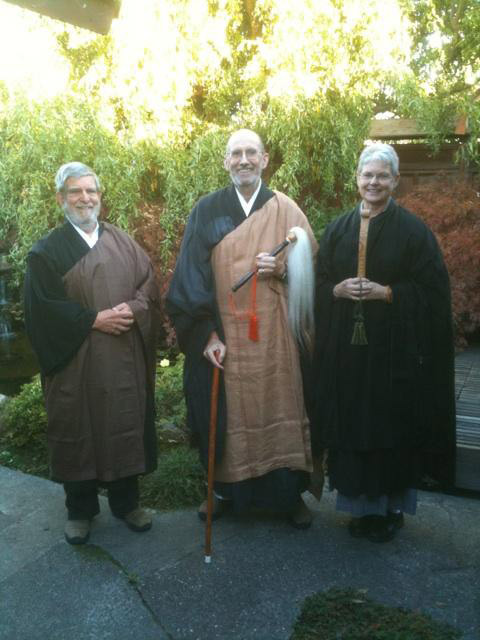 Newcomers who had practiced at Zen Center before. You had returned from a life outside of the monastery to be our Abbot, our compassionate “father”, and I had just returned from Germany. I became your Jisha, and we both stumbled through the morning darkness, re-learning our steps. I walked behind you, prepared to catch the Abbott in case he fell down. You never did. But you often caught me, when I tripped in my attempts to practice. You told me about the Native American idea of “walking in beauty”, and I will always remember this time as the time when we, together, walked in beauty. I am forever grateful for your kindness and support. All dewdrops will fall from the crane’s bill. But I have a deep intuition that their moisture will nurture the earth and continue the flow of life. I pray that you feel deeply supported by your wife and family, your doctors and nurses, the Zen Community and, above all, the inconceivable kindness of the Dharma.